Stan Bowman was named the named the ninth General Manager in Blackhawks history on July 14, 2009. For a list of draft picks, check here. Note: Bowman has been responsible for drafts beginning in 2010. Here is a comprehensive list of the moves Bowman has made since becoming GM. Nov. 6, 2018 – fired head coach Joel Quenneville and assistant coaches Kevin Dineen and Ulf Samuelsson. Nov. 6, 2018 – named Jeremy Colliton head coach. Oct. 7, 2009 – traded D Aaron Johnson to Calgary for F Kyle Greentree. Feb. 10, 2010 – traded D Cam Barker to Minnesota for D Kim Johnsson and D Nick Leddy. March 1, 2010 – traded G Joe Fallon to St. Louis for G Hannu Toivonen and D Danny Richmond. March 2, 1010 – traded future considerations to Anaheim for D Nick Boynton. June 20, 2010 – traded F Kris Versteeg and F Billy Sweatt to Toronto for F Viktor Stalberg, F Philippe Paradis and F Chris DiDomenico. June 25, 2010 – traded the Blackhawks 1st round pick (#30 – Brock Nelson) to the New York Islanders for their 2nd round picks (#35 – Ludvig Rensfeldt) and #58 (#58 – Kent Simpson). June 25, 2010 – traded the Flames 2nd round pick #43 (acq. from CGY in Rene Bourque trade – Brad Ross) to the Toronto Maple Leafs for F Jimmy Hayes. July 22, 2010 – traded F Marty Reasoner to Florida for F Jeff Taffe. February 9, 2011 – traded F Jack Skille, F Hugh Jessiman and F David Pacan to Florida for F Michael Frolik and G Alexander Salak. February 28, 2011 – traded F Ryan Potulny and a conditional 2nd round pick to Ottawa (#48, subsequently traded to Detroit) for D Chris Campoli. June 25, 2011 – traded D Brian Campbell to Florida for F Rostislav Olesz. June 29, 2011 – traded the conditional 7th round draft pick from Kopecky deal to Buffalo for negotiating rights to D Steve Montador. January 27, 2012 – traded defenseman Brian Connelly to Calgary for center Brendan Morrison. Febuary 27, 2012 – traded 2nd (#61 – Zach Sanford) and 3rd round (#91 – JC Lipon) picks in the 2013 Draft to Winnipeg for defenseman Johnny Oduya. February 27, 2012 – traded defenseman John Scott to the New York Rangers for a 5th round pick in the 2012 Draft (#149 – Travis Brown). June 23, 2012 – traded a 4th round pick in the 2012 Draft (#109 – Christophe Lalancette) to the San Jose Sharks for a 7th round pick in the 2012 Draft (#191-Brandon Whitney) and a 4th round pick in the 2013 Draft. January 21, 2013 – traded a 7th round pick (#198 – John Gilmour) in the 2013 draft to Calgary for G Henrik Karlsson. April 1, 2013 – traded a 4th round pick (acquired June 23, 2012 from San Jose) to San Jose for center Michal Handzus. June 30, 2013 – traded forward Dave Bolland to Toronto for 2nd (#51 – Carl Dahlström) and 4th (#117 – traded to San Jose for #111 – Robin Norell) round picks in the 2013 Draft and a 4th round pick (#98 – Fredrik Olofsson) in the 2014 Draft. June 30, 2013 – traded forward Michael Frolik to Winnipeg for a 3rd (#74 – John Hayden) and 5th (#134 – Luke Johnson) round picks in the 2013 Draft. July 16, 2013 – traded forward Daniel Carcillo to Los Angeles for a conditional pick in the 2015 NHL Draft. December 14, 2013 – traded future considerations to Edmonton for G Jason LaBarbera, who was assigned to Rockford. February 26, 2014 – traded F Brad Winchester to Minnesota for D Brian Connelly, who was assigned to Rockford. March 2, 2014 – traded F Brandon Pirri to Florida for the Panther’s third round pick (#62 – subsequently traded to SJ on June 27) in the 2014 NHL Draft and their fifth round pick in the 2016 NHL Draft. March 4, 2014 – traded a second round pick in the 2014 NHL Draft (#58 – Christian Dvorak) to Phoenix for defensemen David Rundblad and Mathieu Brisbois. June 27, 2014 – traded the 27th (Nikolay Goldobin) and 62nd (traded to NSH – Justin Kirkland) overall picks in the 2014 NHL Draft to San Jose for the 20th (Nick Schmaltz) and 178th selections. June 28, 2014 – traded F Brandon Bollig to Calgary for a third round pick in the 2014 NHL Draft (#83 – Matheson Iacopelli). October 4, 2014 – traded defenseman Nick Leddy and goaltender Kent Simpson to the New York Islanders for defensemen T.J. Brennan and Ville Pokka and the rights to restricted free agent goaltender Anders Nilsson. December 14, 2014 – traded forward Jeremy Morin to Columbus for defenseman Tim Erixon. January 29, 2015 – traded defenseman Adam Clendening to Vancouver for defenseman Gustav Forsling. February 26, 2015 – traded defenseman T.J. Brennan to Toronto for forward Spencer Abbott. February 28, 2015 – traded defenseman Klas Dahlbeck and a first round pick in the 2015 NHL Draft to Arizona for center Antoine Vermette. March 2, 2015 – acquired forward Andrew Desjardins from San Jose for forward Ben Smith and a conditional 7th round pick in 2016. June 27, 2015 – acquired forward Ryan Haggerty from the NY Rangers for goalie Antti Raanta. June 30, 2015 – acquired forwards Artem Anisimov, Jeremy Morin, Corey Tropp and Marko Dano and a 4th round pick in the 2016 NHL Draft from Columbus for forwards Brandon Saad and Alex Broadhurst and defenseman Mike Paliotta. July 6, 2015 – acquired forward Liam Coughlin from Edmonton for goaltender Anders Nilsson. September 11, 2015 – acquired defensemen Dennis Robertson and Jake Massie and a 5th round pick in the 2017 NHL Draft from Carolina for forwards Kris Versteeg and Joakim Nordstrom and a 3rd round pick in the 2017 NHL Draft. January 3, 2016 – acquired forward Richard Panik from Toronto for forward Jeremy Morin. January 21, 2016 – acquired forward Jiri Sekac from Anaheim for forward Ryan Garbutt. February 29, 2016 – acquired goaltender Drew MacIntyre from Carolina for defenseman Dennis Robertson. February 29, 2016 – acquired forward Tim Jackman and a 7th round pick in 2017 from Anaheim for forward Corey Tropp. June 15, 2016 – acquired the New York Rangers’ second round pick (#50 – Artur Kayumov) in the 2016 NHL Draft and the Canes’ third round pick in 2017 (TBD) from Carolina for forwards Teuvo Teravainen and Bryan Bickell. June 24, 2016 – acquired two second round picks (#39 Alex DeBrincat & #45 Chad Krys) in the 2016 NHL Draft from Montreal for forward Andrew Shaw. June 25, 2016 – traded a fourth round pick (#95 – Anatoli Golyshev) to the New York Islanders for a fourth round pick (#110 Lucas Carlsson) and a sixth round pick in 2017. February 24, 2017 – acquired forward Tomas Jurco from Detroit for a third round pick in the 2017 NHL Draft. February 28, 2017 – acquired defenseman Johnny Oduya from Dallas for forward Mark McNeill and a conditional fourth round draft pick in the 2018 NHL Draft. March 1, 2017 – acquired forward Kenton Hegelsen and a seventh round pick in the 2019 NHL Draft from Anaheim for forwards Sam Carrick and Spencer Abbott. April 28, 2017 – traded goaltender Scott Darling to Carolina for a third round pick in the 2017 NHL Draft. June 23, 2017 – traded defenseman Niklas Hjalmarsson to Arizona for defenseman Connor Murphy and center Laurent Dauphin. June 23, 2017 – traded forwards Artemi Panarin and Tyler Motte with a sixth round (#170 overall) draft pick in the 2017 NHL Draft to Columbus for forward Brandon Saad, goaltender Anton Forsberg and a fifth round pick in the 2018 NHL Draft. June 24, 2017 – traded a fifth round pick (#135 – Kristoffer Gunnarsson) and a sixth round pick (#181 – Petrus Palmu) in the 2017 NHL Draft to Vancouver for a fourth round pick (#112- F Tim Soderlund) in the 2017 NHL Draft. July 2, 2017 – traded forward Marcus Kruger to Vegas for future considerations. October 4, 2017 – traded forward Kyle Baun to Montreal for forward Andreas Martinsen. January 10, 2018 – traded forwards Richard Panik and Laurent Dauphin to Arizona for forward Anthony Duclair and defenseman Adam Clendening. February 16, 2018 – traded defenseman Ville Pokka to Ottawa for forward Chris DiDomenico. February 19, 2018 – traded defenseman Michal Kempny to Washington for a conditional 3rd round pick in the 2018 NHL Draft (#87 overall – subsequently traded to Arizona on 06/23/18). February 26, 2018 – traded forward Ryan Hartman and a 5th round pick in the 2018 NHL Draft to Nashville for forward Victor Ejdsell, a 1st round pick in the 2018 NHL Draft (#27 Nicolas Beaudin) and a 4th round pick in the 2018 NHL Draft. February 26, 2018 – traded forward Tommy Wingels to Boston for a 5th round pick in the 2019 NHL Draft. June 23, 2018 – traded a 3rd round pick (#87 Linus Karlsson) and 5th round pick (#142 Michael Callahan) in the 2018 NHL Draft to Arizona for a 3rd round pick (#74-Niklas Nordgren) in the 2018 NHL Draft. June 23, 2018 – traded a 5th round pick in the 2019 NHL Draft to Montreal for a 5th round pick (#139 Mikael Hakkarainen) in the 2018 NHL Draft. June 24, 2018 – traded forward Tanner Kero to Vancouver for forward Michael Chaput. June 27, 2018 – traded goaltender JF Berube to Columbus for forward Jordan Schroeder. July 12, 2018 – traded forwards Marian Hossa and Vincent Hinostroza, defenseman Jordan Oesterle and 3rd round pick in the 2019 NHL Draft to Arizona for forwards Marcus Kruger, Mackenzie Entwistle and Jordan Maletta, defenseman Andrew Campbell and 5th round pick in the 2019 NHL Draft. November 25, 2018 – traded forward Nick Schmaltz to Arizona for forwards Dylan Strome and Brendan Perlini. December 30, 2018 – traded defensemen Brandon Manning and Robin Norell to Edmonton for forward Drake Cagguila and defenseman Jason Garrison. February 18, 2019 – traded defenseman Darren Raddysh to the New York Rangers for forward Peter Holland. February 24, 2019 – traded forward Matheson Iacopelli to the Los Angeles Kings for forward Spencer Watson. August 2, 2010 – declined arbitration decision with G Antti Niemi. September 25, 2010 – waived G Cristobal Huet; assigned to minors (loaned to Europe). September 23, 2013 – placed F Kyle Beach on waivers (loaned to Europe). February 22, 2014 – placed D Mike Kostka on waivers (claimed by TB Feb. 23). August 1, 2014 – 2010 first round pick F Kevin Hayes opts to not sign with Chicago; signs with NY Rangers. February 28, 2015 – placed D Tim Erixon on waivers (claimed by TOR March 1). December 5, 2015 – placed F Viktor Tikhonov on waivers (claimed by ARI Dec. 6). December 28, 2015 – placed D David Rundblad on waivers (loaned to Europe). July 24, 2016 – released D David Rundblad. June 21, 2017 – D Trevor van Riemsdyk selected by the Vegas Golden Knights in the 2017 Expansion Draft. July 20, 2009 – signed F Danny Bois. February 17, 2010 – signed D Jassen Cullimore. April 3, 2010 – signed F Brandon Bollig to a two-year, entry-level contract. July 2, 2010 – signed F/D John Scott to a two-year, $1.25M deal. July 17, 2010 – matched San Jose offer sheet with D Niklas Hjalmarsson, four-years, $14M deal. July 28, 2010 – re-signed F Bryan Bickell to a three-year, $1.625M deal. July 31, 2010 – signed D Nick Leddy to a three-year, entry-level deal. August 2, 2010 – signed G Marty Turco to a one-year, $1.3M deal. August 3, 2010 – signed F Igor Makarov to a two-year deal. August 4, 2010 – signed F Hugh Jessiman. August 4, 2010 – re-signed F Evan Brophey. August 4, 2010 – re-signed G Hannu Toivonen. August 4, 2010 – re-signed F Nathan Davis. August 4, 2010 – re-signed D Jassen Cullimore. August 11, 2010 – re-signed D Jordan Hendry to a one-year, $600k deal. August 16, 2010 – re-signed D Nick Boynton to a one-year, $500k deal. August 24, 2010 – signed F Fernando Pisani to a one-year, $500k deal. August 31, 2010 – signed F Brandon Pirri to a three-year, entry-level deal. September 9, 2010 – signed F Ryan Potulny to a one-year, $500k deal. November 26, 2010 – signed D Garnet Exelby. December 17, 2010 – signed F Ryan Johnson to a one-year, $500k deal. January 1, 2011 – signed D Dylan Olsen to a three-year, entry-level deal. February 27, 2011 – signed D Brent Seabrook to a five-year, $29M extension. March 31, 2011 – signed F Jimmy Hayes to a three-year, entry-level deal. April 12, 2011 – signed D Joe Lavin to a two-year, entry-level deal. May 20, 2011 – signed G Corey Crawford to a three-year, $8M deal. May 31, 2011 – signed Fs Byron Froese and David Gilbert to three-year, entry-level deals. May 31, 2011 – signed G Alexander Salak to a two-year, $1.225M contract. June 30, 2011 – signed D Steve Montador to a four-year, $11M contract. July 1, 2011 – signed F Jamal Mayers to a one-year, $550k contract. July 1, 2011 – signed D Sean O’Donnell to a one-year, $850k contract. July 1, 2011 – signed F Andrew Brunette to a one-year, $2M contract. July 1, 2011 – signed F Dan Carcillo to a one-year, $775k contract. July 10, 2011 – re-signed F Viktor Stalberg to a two-year, $1.75M contract. July 13, 2011 – re-signed minor-league D Brian Connelly to a one-year contract. July 15, 2011 – signed D Sami Lepisto to a one-year, $750k contract. July 15, 2011 – re-signed F Michael Frolik to a three-year, $7M contract. August 3, 2011 – signed F Patrick Sharp to a five-year, $29.5M extension. October 2, 2011 – signed G Ray Emery to a one-year, $600k deal. January 2, 2012 – signed F Mark McNeill to a three-year, entry-level contract. January 2, 2012 – signed F Phillip Danault to a three-year, entry-level contract. January 3, 2012 – signed F Andrew Shaw to a three-year, entry-level contract. March 12, 2012 – signed F Daniel Carcillo to a two-year, $1.65M contract. March 19, 2012 – signed F Terry Broadhurst to a two-year, entry-level contract. April 7, 2012 – signed G Ray Emery to a one-year, $1.15M contract. May 15, 2012 – signed F Rob Flick to a three-year, entry-level contract. May 29, 2012 – signed G Mac Carruth to a three-year, entry-level contract. May 29, 2012 – signed G Kent Simpson to a three-year, entry-level contract. May 29, 2012 – signed F Joakim Nordstrom to a three-year, entry-level contract. May 29, 2012 – signed D Klas Dahlbeck to a three-year, entry-level contract. May 29, 2012 – signed F Jamal Mayers to a one-year, $650k contract. May 29, 2012 – signed D Johnny Oduya to a three-year, $10.125M contract. May 31, 2012 – signed D Adam Clendening to a three-year, entry-level contract. June 18, 2012 – signed G Carter Hutton to a one-year, two-way contract. June 18, 2012 – signed F Ben Smith to a two-year extension. June 18, 2012 – signed F Brandon Bollig to a two-year extension. July 1, 2012 – signed D Sheldon Brookbank to a two-year, $2.5M contract. July 2, 2012 – signed F Martin St. Pierre to a one-year, two-way contract. September 11, 2012 – signed D Michal Rozsival to a one-year, $2.0M contract. April 9, 2013 – signed F Garret Ross to a three-year, entry-level contract. April 12, 2013 – signed F Drew LeBlanc to a one-year contract. May 31, 2013 – signed F Alex Broadhurst to a three-year, entry-level contract. June 3, 2013 – signed G Antti Raanta to a one-year contract. June 30, 2013 – signed F Bryan Bickell to a four-year, $16M contract. July 3, 2013 – signed D Nick Leddy to a two-year, $5.4M contract. July 12, 2013 – signed F Marcus Kruger to a two-year contract. July 15, 2013 – signed D Ryan Stanton to a one-year contract. July 17, 2013 – signed F Kyle Beach to a one-year contract. July 19, 2013 – signed F Drew LeBlanc to a two-year contract. July 19, 2013 – signed D Theo Peckham to a one-year contract. July 19, 2013 – signed D Michael Kostka to a one-year contract. July 24, 2013 – signed F Brad Winchester to a one-year contract. August 22, 2013 – signed F Teuvo Teravainen to a three-year, entry-level contract. October 19, 2013 – signed D Viktor Svedberg to a two-year contract. October 25, 2013 – signed F Brad Mills to a one-year contract. November 12, 2013 – signed F Andrew Shaw to a two-year, $4M extension. November 18, 2013 – signed F Ryan Hartman to a three-year, entry-level contract. March 3, 2014 – signed F Brandon Bollig to a three-year, $3.75M extension. March 10, 2014 – signed D Dillon Fournier to a three-year, entry-level contract. March 19, 2014 – signed F Brandon Mashinter to a two-year, two-way contract extension. March 20, 2014 – signed F Matt Carey to a two-year contract. March 24, 2014 – signed D Trevor vanRiemsdyk to a two-year, entry-level contract. April 2, 2014 – signed D Stephen Johns to a two-year, entry-level contract. June 10, 2014 – signed F Dennis Rasmussen to a one-year contract. June 27, 2014 – signed G Antti Raanta to a two-year extension. June 27, 2014 – signed F Ben Smith to a two-year extension. June 27, 2014 – signed F Jeremy Morin to a two-year extension. July 1, 2014 – signed F Brad Richards to a one-year contract. July 1, 2014 – signed G Scott Darling to a one-year, two-way contract. July 1, 2014 – signed F Peter Regin to a one-year contract. July 1, 2014 – signed F Pierre-Cedric Labrie to a one-year, two-way contract. July 1, 2014 – signed F Cody Bass to a one-year, two-way contract. July 2, 2014 – signed D Kyle Cumiskey two a one-year contract. 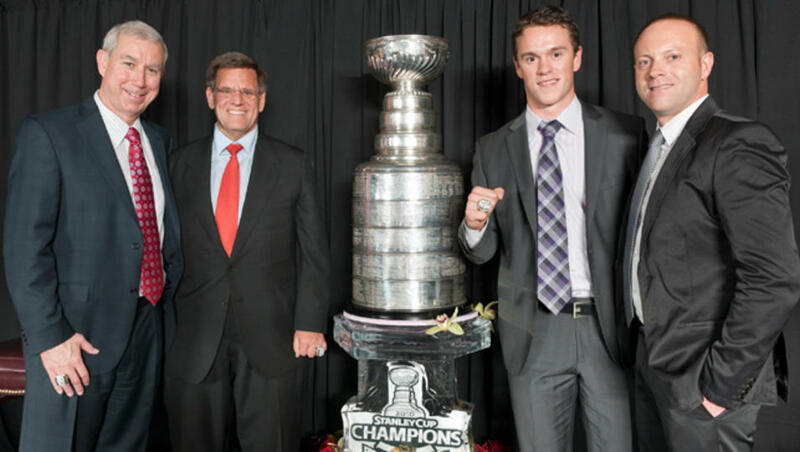 July 9, 2014 – signed F Jonathan Toews to an eight-year, $84M extension. July 9, 2014 – signed F Patrick Kane to an eight-year, $84M extension. August 18, 2014 – signed G Michael Leighton to a one-year, two-way contract. October 4, 2014 – signed F Daniel Carcillo to a one-year, $550k deal. February 22, 2015 – signed G Scott Darling to a two-year extension. March 21, 2015 – signed F Vince Hinostroza to a three-year contract. March 26, 2015 – signed F Kyle Baun to a two-year contract. March 26, 2015 – signed D Mike Paliotta to a two-year contract. April 2, 2015 – signed F Tanner Kero to a two-year contract. April 30, 2015 – signed D Erik Gustafsson to a two-year contract. May 1, 2015 – signed F Artemi Panarin to a two-year contract. June 29, 2015 – signed D David Rundblad to a two-year contract. June 30, 2015 – signed G Michael Leighton to a one-year contract. July 1, 2015 – signed F Viktor Tikhonov to a one-year contract. July 1, 2015 – signed F Artem Anisimov to a five-year extension. July 2, 2015 – signed D Cameron Schilling to a two-year contract. July 3, 2015 – signed F Andrew Desjardins to a two-year contract. July 7, 2015 – signed D Trevor van Riemsdyk to a two-year extension. July 9, 2015 – signed F Dennis Rasmussen to a one-year contract. August 5, 2015 – signed D Viktor Svedberg to a one-year contract. August 18, 2015 – signed D Nolan Valleau to a two-year contract. September 2, 2015 – signed F Joakim Nordstrom to a one-year contract. September 11, 2015 – signed F Marcus Kruger to a one-year, $1.5M contract. September 19, 2015 – signed D Michal Rozsival to a one-year contract. September 26, 2015 – signed D Brent Seabrook to an eight-year, $55M extension. October 15, 2015 – signed D Kyle Cumiskey to a one-year contract. February 28, 2016 – signed G Mac Carruth thru the remainder of the 2015-16 season. March 3, 2016 – signed F Kyle Baun to a two-year extension. March 8, 2016 – signed F Marcus Kruger to a three-year, $9.25M extension. March 14, 2016 – signed D Viktor Svedberg to a two-year extension. March 31, 2016 – signed D Robin Norell to a three-year, entry-level contract. April 6, 2016 – signed F Tyler Motte to a three-year, entry-level contract. April 14, 2016 – signed D Carl Dahlstrom to a three-year, entry-level contract. May 12, 2016 – signed D Gustav Forsling to a three-year, entry-level contract. May 24, 2016 – signed G Lars Johansson to a one-year contract. May 24, 2016 – signed D Michal Kempny to a one-year, $925k contract. May 24, 2016 – signed F Martin Lundberg to a one-year contract. June 14, 2016 – signed G Mac Carruth to a one-year extension. June 15, 2016 – signed F Richard Panik to a one-year, $875k contract. June 24, 2016 – signed F Nick Schmaltz to a three-year, entry-level contract. June 30, 2016 – signed D Michal Rozsival to a one-year, $600k contract. June 30, 2016 – signed F Brandon Mashinter to a one-year, $575k contract. July 1, 2016 – signed D Brian Campbell to a one-year, $2.25M contract. July 1, 2015 – signed F Sam Carrick to a one-year contract. July 1, 2015 – signed F Spencer Abbott to a one-year contract. July 1, 2015 – signed F Pierre-Cedric Labrie to a one-year contract. July 5, 2016 – signed F Jordin Tootoo to a one-year, $750k contract. July 15, 2016 – signed F Mark McNeill to a one-year, $600k contract. September 26, 2016 – signed F Alexandre Fortin to a three-year, entry-level contract. September 30, 2016 – signed F Graham Knott to a three-year, entry-level contract. November 7, 2016 – signed F Alex DeBrincat to a three-year, entry-level contract. December 28, 2016 – signed F Artemi Panarin to a two-year, $12M extension. February 24, 2017 – signed G Jeff Glass to a two-year, two-way contract. February 28, 2017 – signed F Jordin Tootoo to a one-year extension. February 28, 2017 – signed D Michal Rozsival to a one-year extension. March 2, 2017 – signed F Matthew Highmore to a three-year, entry-level contract. March 12, 2017 – signed F John Hayden to a two-year, entry-level contract. March 13, 2017 – signed F Anthony Louis to a two-year, entry-level contract. March 15, 2017 – signed D Luc Snuggerud to a three-year, entry-level contract. March 23, 2017 – signed F Tanner Kero to a two-year extension. March 28, 2017 – signed F Matheson Iacopelli to a two-year, entry-level contract. April 27, 2017 – signed F Nathan Noel to a three-year, entry-level contract. May 2, 2017 – signed F David Kampf to a two-year contract. May 11, 2017 – signed F Richard Panik to a two-year, $5.6M extension. May 27, 2017 – signed D Michal Kempny to a one-year extension. June 7, 2017 – signed D Jan Rutta to a one-year contract. June 26, 2017 – signed G Anton Forsberg to a two-year extension. June 26, 2017 – signed F Tomas Jurco to a one-year extension. June 27, 2017 – signed D Ville Pokka to a one-year extension. July 1, 2017 – signed F Tommy Wingels to a one-year contract. July 1, 2017 – signed G Jean-Francois Berube to a two-year contract. July 1, 2017 – signed F Lance Bouma to a one-year contract. July 1, 2017 – signed D Jordan Oesterle to a two-year contract. July 1, 2017 – signed F Patrick Sharp to a one-year contract. July 14, 2017 – signed D Erik Gustafsson to a one-year contract. July 28, 2017 – signed G Collin Delia to a two-year contract. October 4, 2017 – signed F Bryan Bickell to a one-day* contract. October 4, 2017 – signed D Cody Franson to a one-year contract. March 6, 2018 – signed D Erik Gustafsson to a two-year extension. March 6, 2018 – signed F Tyler Sikura to a one-year contract. March 9, 2018 – signed D Jan Rutta to a one-year extension. March 25, 2017 – signed F Dylan Sikura to a two-year, entry-level contract. March 27, 2018 – signed D Blake Hillman to a two-year, entry-level contract. March 28, 2018 – signed D Joni Tuulola to a two-year, entry-level contract. April 13, 2018 – signed D Dennis Gilbert to a three-year, entry-level contract. April 28, 2018 – signed F Dominik Kahun to a two-year, entry-level contract. April 28, 2018 – signed D Lucas Carlsson to a three-year, entry-level contract. April 28, 2018 – signed G Kevin Lankinen to a two-year, entry-level contract. April 28, 2018 – signed D Darren Raddysh to a two-year contract. May 31, 2018 – signed F Jacob Nilsson to a one-year contract. June 7, 2018 – signed F Andreas Martinsen to a two-year extension. June 12, 2018 – signed D Henri Jokiharju to a three-year, entry-level contract. June 15, 2018 – signed F John Hayden to a two-year extension. June 15, 2018 – signed F Vinnie Hinostroza to a two-year extension. July 1, 2018 – signed F Chris Kunitz to a one-year contract. July 1, 2018 – signed D Brandon Manning to a two-year contract. July 1, 2018 – signed G Cam Ward to a one-year contract. July 1, 2018 – signed D Adam Boqvist to a three-year, entry-level contract. Sept. 27, 2018 – signed D Brandon Davidson to a one-year contract. Oct. 16, 2018 – signed F MacKenzie Entwistle to a three-year, entry-level contract. Oct. 30, 2018 – signed F Brandon Hagel to a three-year, entry-level contract. Nov. 9, 2018 – signed D Nicolas Beaudin to a three-year, entry-level contract. Feb. 11, 2019 – signed G Collin Delia to a three-year extension. March 6, 2019 – signed F Reese Johnson to a three-year, entry-level contract. March 12, 2019 – signed F Philip Kurashev to a three-year, entry-level contract. Ronald Witt says probably the best GM Illinois has ever seen. I don’t think so. Let Niemmi go by refusing to pay him more than $2 M/yr in order to keep Hjalmersson (a soft defensemen) @ $3.5 M/yr. Then 10 months later signs Crawford for $2.7 M/yr. Arguably could have kept Niemmi, left Hjalmer go and have $4M/yr to spend on a replacement D-man. The recent 9 game losing streak would not have occurred if they had retained Niemmi. Cup winning goalies are worth keeping. Stan Bowman seems a lot better at finding good prospects than making trades. Bowman needed to try to get a goalie, a center and and a good d-man. He missed some opportunities like Antoine Vermette, a high energy center. Emery is OK as backup but Crawford is too big of question as a starter. I thought Emery actually kept the Blackhawks in against the Ducks, but a lack of offense kept the puck in the Blackhawks end the last 45 minutes of the game. With young players like Michael Frolick,Marcus Kruger, Ben Smith, Adam Shaw, Rostislav Olesz and draft picks that could be moved, it is inexcusable not to do anything. Please no more old has been like Morrison, Burnette or O’Donnel. Something needs to light a fire under the players. Perhaps it is time to change the head coach too! Our special teams power play, penalty kill are an embarrassment. Worse yet it the lack of defense and checking and hitting, lack of an offensive attack and thus lack of shots on goals. I rather see Icehogs play like Andrew Shaw at center than Morrison. The Blackhawk team that was on the ice the last 2 games against the Kings and Ducks, would be lucky just to creep into the playoffs. Please Stan – grow some balls, make some trades. How about a goalie from Minnesota or Boston? A good solid shutdown d-man? Or a gritty center? Nice format makes things clear. What strikes me is most of his moves have been subtraction even be it for cap or profitability issues. I like to look at the interaction between other Gms. Barker /Leddy in hindsight it has been his best move only because Barker has not played. At the time it was a dump! Leddy will be lucky(and a solid d man) if he gets to Barkers 2008 2009 numbers. Of course Barker most likely will never get there again either..
Now the crippler Dustin Byfuglien, Ben Eager, Brent Sopel for Morin and Hayes. By undervaluing the importance of the two biggest physical presences on the team it effectively broke the back of the teams chemistry..
Colin played hard had GWGS although minor his loss was felt we still talk centers. July 1, 2010 – traded F Andrew Ladd to Atlanta for D Ivan Vishnevskiy and a 2011 second-round pick (#36 overall – D Adam Clendening) what can be said except completely LOSS..
Lastly Morrison for the best prospect on the AHL team….. I Would submit a dismantling and rebuild has been in the works since the title. The principal thought being the Media attention /marketability of superstar players would trump any underachievement due to lost players. A good GM manipulates the cap, asks for favors from players to keep teams together does whatever it takes. The history looks like a perfect storm of miscues errors and give away’s. Can this all be blamed on cap issues or Was it something about candy and a baby??? I look at Stand Bowman and I constantly see that ” Dear in the headlights ” look. As mentioned before he needs to grow a pair,quick! However, I don’t lay the blame totally at his feet. I strongly believe it’s time for Q to go. I guess I would pray to the hockey Gods that Q goes, and is replaced by Scotty Bowman! Could it happen or am I dreaming of an impossibility?? Just a thought. ” Stand still Bowman ” that is. Paledevil, sadly you are absolutely correct in your summation of Stand’s disastrous dealings. Some people obviously don’t have a clue. While Bowman hasn’t done A+ work he is far from F. I would rate him at a A-/B+ right now. And yes I looked at each trade he made, signing, and non-signing. He’s had some brilliant trades like Barker for Leddy, Campbell for Olesz (it’s the contract that was important), 2nd and 3rd for Oduya, and Kopecky for Montador. His drafts have been stellar. His signings are a mixed. He did resign our core which is HUGE. The only issue is the Hammer and Niemi deals. At the time we were working with a crappy salary cap situation because of bonuses that caused us to lose valuable cap space. So at the time Hammer was kept and in actuality Niemi was given a solid offer even with Hammer’s contract. Niemi decided he wanted greener pastures. Instead signed a one year deal for 2 mil. He knew we were strapped and all he had to do was take a small paycut for 1 year, that’s right 1 year and if he played well he would have gotten the same money that Crawford got instead, maybe more. But the difference is we would have had the cap space to give it to him. But no, Niemi got greedy and walked away. Those of you who are throwing Buff, Ladd, Verstegg around as examples of bad trades have forgotten the mess we were in, the other teams knew it, and we no choice but to get raped in some instances. This is not Bowman’s fault but Tallon’s. He screwed up the qualifying offers and we ended up with nasty contracts that we had to honor. That resulted in the salary cap crisis after the Cup. Also Campbell’s contract was a complete disaster as well. Campbell is a great player, but he was overpaid or in other words his cap hit was too high. He could have still gotten paid that amount had Tallon had the forethought to sign him to a deal like Hossa. More money upfront, longer term deal, lower cap hit. It’s also the NHL’s fault for not allowing re-negotiation of contracts and heavy handed salary caps. There should be some wiggle room when it comes to a cap. Hes doing a good job,espicially in a salary cap world,good drafting n building for the future,What ididnt like is not signing Niemi,a rookie with not even 82 games played wins a cup,you sign him,hes human and he will make mistakes now he s got to fixem!!! Looking at this year’s SCF cast of characters, it’s almost hard to believe anyone had any questions about Crawford or Emery. Boy, Bowman really did a solid job all things considered. I believe, I believe, I believe. Does the LeBlanc kid (Hobey Baker winner) count as a FA signing? I’m hoping he sticks around. Stan has actually done a very good job, IMO. And know what, ScottyE? We haven ‘t heard a peep out of those detractors since! And people need to know the history of the Hjalmarsson and Niemi decisions! Ya know I’m looking back on all the comments that were left earlier in this segment and I can’t help but laugh, but I know you are all laughin at your comments as well. What Stan has done is change the way the game of hockey will generate future great teams, as you see, we built from the ground up after 2010 and did the right thing in keeping the core together. His drafting skills are second to none and as a blackhawk fan I can’t help but love seeing home grown players succeed. This team will do damage for hopefully the years to come and I am super excited. Will the Blackhawks trade Patrick Sharp or will sharp stay in chicago for his 9th season. Montreal Canadiens interested in sharp. so if the habs trade emelin and plekanec and moen a 2015 pick for sharp, kruger. 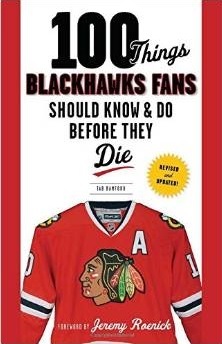 Would the blackhawks be able to win the stanley cup in 2015.
a lot of churning and salary cap moves. the result is a team that presently has no toughness and a very pronounced inability to score consistently. with kane down for the season they’re really “over the barrel”. Stan, you traded Ben Smith to a bunch of losers for a couple of bucks. He got a raw deal. Are the Hawks playing any better now? Nope…the only one really holding the team together this year is out with a major injury. Kaner’s our boy. I’m amazed at the large number of players that filter through the Blackhawk Organization and the small number that stick. The mechanics of the Niemi are thus. It was reported Niemi wanted very much to stay (more than the usual BS) and a number had been suggested as agreeable and at which the Hawks could keep Hammer whom Q wanted. Wilson, Shark GM, put out an offer sheet with a number that Niemi couldn’t refuse. A hard lesson for all around. I sympathisize wirh SB who thought he had the inside track on a young kid who the year before had run the zamboni in his father’s rink in Finland. My only regrets are Ladd and Buff going, the rest? eh ? I vote for an A on Saad’s sweater if Sharpie is traded. Not sure which history Maybe ’15 is subscribing to, but the offer sheet was given to Hjalmarsson. The Blackhawks declined the number that was given to Niemi in arbitration and he was free to sign elsewhere. At the end of the day, the Blackhawks are far better off having kept Hjalmarsson than Niemi. Absolutely correct about Hjalmarsson over Niemi, Tab. I’d hate to even think where our defense would be right now without #4. 2) the second Versteeg trade. While Versteeg came up big in the Finals, it’s tempting to see what a talent with the size of Jimmy Hayes could be doing for the Hawks. He would be playing the role that the Hawks wish Bickell would do with consistency. He’s going to be a key cog for the Florida team for a while. Other than those two (and those are minor), Bowman has shown himself, in my opinion, to be the finest GM in the league, especially when you consider the cap issues he has had to maneuver. Isaiah – in what salary cap world do the Hawks afford Andrew Ladd? No… sorry. Boy, I hope all the geniuses who posted their idea re-visit them. I especailly like the keep Niemi and easily replace Hammer one. this web site and reading very infoirmative articles aat this place. Self-stockage, garde-meuble pas cher à lausanne et dans plusieurs villes Suisse. self-stockage sécurisé à tarif que l’on ne pas battre avec wifi offert.